rv-pro.com September 2018 • RV PRO • 103 "I think we just have more choices in life," says Pat Perrella, executive director of career services for the University of Denver. "Where it used to be that you would go and work for a com- pany in a white-collar or a blue-collar job – and you would be there for life – now you just don't see a lot of people having that length of service with a company anymore." Indeed, across many professions today, there exists a con- siderable amount of uncertainty – from layoffs to disappearing pensions, leaving working professionals in a position where they have to grow and adapt in order to remain employed. "One of the great things about having experience in life is you learn not only what you like, but also what you don't like," Perrella says. "This allows you to be much more careful in the choices you make, as they apply to careers and job opportunities." Career experts estimate individuals in the workforce change careers between three and seven times over the course of their working lives. The U.S. Bureau of Labor Statistics, the agency within the U.S. Department of Labor tasked with collecting employment-related data, doesn't report this figure, stating that no consensus has emerged on what actually constitutes a career change. However, the BLS did report in 2015 that a subset of the working population, young Baby Boomers, change jobs an average of 11.7 times over the course of their working lives. Bill Redmond (standing at right on page 102) began his professional career in the oil and gas industry and then transitioned to the venture capital business. 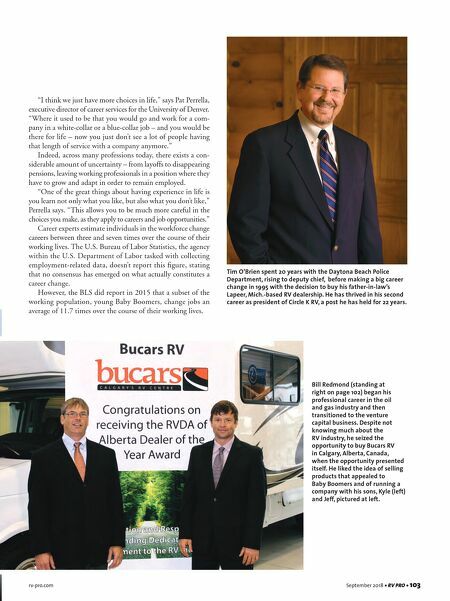 Despite not knowing much about the RV industry, he seized the opportunity to buy Bucars RV in Calgary, Alberta, Canada, when the opportunity presented itself. He liked the idea of selling products that appealed to Baby Boomers and of running a company with his sons, Kyle (left) and Jeff, pictured at left. 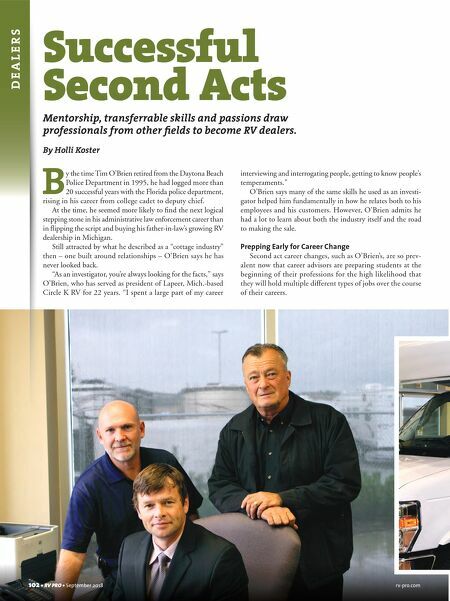 Tim O'Brien spent 20 years with the Daytona Beach Police Department, rising to deputy chief, before making a big career change in 1995 with the decision to buy his father-in-law's Lapeer, Mich.-based RV dealership. He has thrived in his second career as president of Circle K RV, a post he has held for 22 years.